Twelve pictures, twelve tales of crime and mystery. These short stories open up a world of intrigue, suspense and fear. 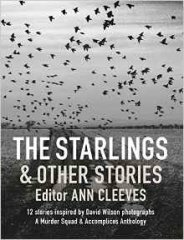 With contributions from celebrated crime writers including Ann Cleeves, Cath Staincliffe and Martin Edwards, each tale was inspired by the atmospheric and evocative work of photographer David Wilson. Murder Squad are a collective of six crime writers. They are Ann Cleeves (author of the Vera books which inspired ITV’s Vera, starring Brenda Blethyn), Martin Edwards, Cath Staincliffe, Kate Ellis, Margaret Murphy and Chris Simms. Each member invited an accomplice to write a story for the collection.